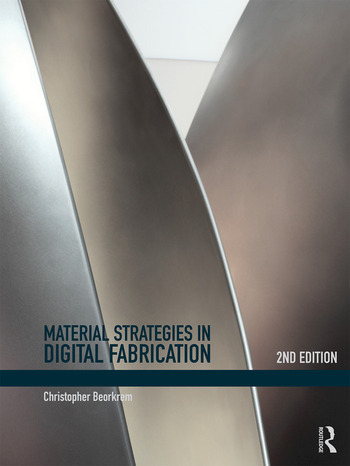 In this second edition of Material Strategies in Digital Fabrication are new case studies, improved wayfinding, the inclusion of composites and plastics, and references to similar strategies between different projects. In 400 step-by-step diagrams dissecting 39 case studies in 10 countries on 3 continents, the book shows you how material performance drives the digital fabrication process and determines technique. The book identifies the important characteristics of each material, including connection types, relative costs, deformation, color, texture, finish, dimensional properties, durability, and weathering and waterproofing to link design outcomes to form. The book is divided into five main chapters by material; wood, metal, concrete/masonry, composites/plastics, and recycled/pre-cycled, to help you reference construction techniques for the fabrication machines you have on-hand. Includes projects by SHoP Architects, Gramazio & Kohler, Schindlersalmeron, The Institute for Computational Design (Achim Menges, Patkau Architects,Sebastien Wierinck, Blue Dot Furniture, Marble Fairbanks, Studio Gang Architects, Macdowell.Tomova, Thomas Heatherwick Studio, Heather Roberge, MX3D, Matsys, Asbjorn Sondergaard, Block Research Group (Phillipe Block), Ball Nogues Studio, Matter Design, WORK Architecture Company, and SoftLab. Part 1: Timber/Wood Products Case Study 1: Dunescape, SHoP Architects Case Study 2: The Sequential Wall, Gramazio & Kohler Case Study 3: Stratifications/ Echord Gramazio & Kohler Case Study 4: Zip Rocker, Schindlersalmeron Case Study 5: ICD/ITKE Pavilion, Achim Menges and Jan Kippers Case Study 6: Winnipeg Skate Shelters/One Fold, Patkau Architects Case Study 7: Bodhi Tree PROJECTiONE Case Study 8: Hygroscopically Enabled Responsiveness Steffen Reichert - Achim Menges Case Study 9: Le Café Caché Sebastien Wierinck Case Study 10: Trondheim Camera Obscura, Norwegian University of Science and Technology Part 2: Metals Case Study 11: Real Good Chair, Blue Dot Case Study 12: Material Formations In Design, Elijah Porter Case Study 13: FlatForm, Marble Fairbanks Case Study 14: Croatian Pavilion, Leo Modrčin Case Study 15: Aqua Tower, Studio Gang Architects Case Study 16: Wave Pavilion Parke MacDowell and Diana Tomova Case Study 17: La Maison Unique Heatherwick Studio Case Study 18: Single Point Incremental Metal Forming Digital Arts Center Case Study 19: Between the Sheets, Heather Roberge, Instructor Case Study 20: MX3D Metal MX3D and Joris Laarman Lab Part 3: Concrete/Masonry Case Study 21: C.A.S.T. Beam, Mark West Case Study 22: P_Wall, Andrew Kudless Case Study 23: UnikaBeton, Asbjørn Søndergaard, Per Dombernowsky Case Study 24: 290 Mulberry Street, SHoP Architects Case Study 25: Structural Oscillations, Gramazio & Kohler Case Study 26: Freeform Catalan Thin-tile Vaults/MLK Stone, Phillipe Block Case Study 27: PreVault Dave Pigram, Ole Egholm Jackson, Niels Martin Larsen Part 4: Composites/Plastics Case Study 28: Composite Cladding Jefferson Ellinger Case Study 29: Periscope: Form Tower, Matter Design Case Study 30: Iridescence Print Gramazio & Kohler Case Study 31: Microtherme Matter Design Case Study 32: Varvac Wall Houminn Studio Case Study 33: bitMAPS PROJECTiONE Case Study 34: Feathered Edge Ball Nogues Studio Case Study 35: Elytra Filament Pavilion Achim Menges, Jan Knippers and Thomas Auer Part 5: Recycled/Pre-Cycled Case Study 36: P. F. 1 WORK.AC Case Study 37: Packed Tom Pawlofsky, Instructor Case Study 38: Bin Dome Rory Hyde Case Study 39: CHROMAtex.me SOFTlab Case Study 40: Pallet Canopy Digital Arts Center Case Study 41: Pipe Furniture Sebastien Wierinck Case Study 42: Table Cloth Ball Nogues Studio Image Credits. References. Index. Christopher Beorkrem is associate professor of architecture at the University of North Carolina, Charlotte.